6:30 a.m., 8:15 a.m. and 10:45 a.m. I love Lent. I love the reflection and pause it requires. 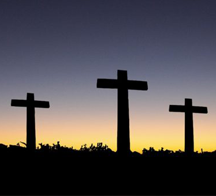 I love the Great Three Days (Maundy Thursday, Good Friday, Easter Vigil) and Easter. I particularly feel moved by the scope of Maundy Thursday. During this service we hear Jesus’ command (Latin for command = maund) to love God and others. Jesus feasts with friends and institutes the last supper. We end worship at his betrayal and arrest. The altar is stripped bare just as He was. 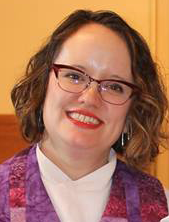 The candles and cloth removed, the Pastor’s stole taken away from her neck. Truly, we have nothing left to show but the stark truth of who Jesus is. We exit the church in silence. We meet again on Good Friday, even though there is hardly anything ‘good’ about it. We remember and witness anew His crucifixion. Scripture. Song. Silence. But in the hushed tones and tears, we know how it ends. We are, after all, Easter people. It is why we gather to worship. Yet throughout Lent, and especially on Maundy Thursday and Good Friday, we immerse ourselves in His Passion and pain. Our grief aches in our hearts. But we know how it ends! I think that is why these days mean so much to our faith, in our hearts. We know what Peter and the disciples do not yet know. We weep with Mary the Mother of Jesus and Mary Magdalene even though we know the joy that comes. The cries of crucify pierce our hearts because of who Jesus is. We know how this ends not only for Jesus, but for ourselves. Join me in this sacred journey, will you? April 19, 12: p.m. and 7:00 p.m.
April 21, 6:30 a.m., 8:15 a.m., 10:45 a.m. Thank you one and all for the prayers, care, and concern for our son, Carter. He underwent a cardiac procedure on 3/15 at the University of WI Madison. They found that one of his heart arrhythmia needed to be left untreated due to its location. A second one needed more information before a treatment decision was made. Carter wore another heart monitor for 48 hours after the procedure to gather that information for the specialist. We meet the specialist at the University again at the end of April. It sounds like we will continue on with a pediatric cardiologist instead of this specialist. Basically we understand Carter is being down-graded in severity and urgency which is great news! Thank you again for all your love! Prayers requested for . . . Marsha Anderson, Sandy Anderson, Sharon Bleecker, Vern Borchardt, Andrew Campbell, Rhonda Cook, Linda Doerr, Isaiah Gravelle, Kim Hannan, Jeremy Schepp, Ruth Smithback, Don Reinders, Karen Weber, Donna Weeks, Shelley Weber Schaitel and those we name silently in our hearts. Check out the brochures that highlight all the camping opportunities at Crossways Camping Ministries. Their summer 2019 program guides are on the table in front of the main office. Opportunities include family programs, grandparent and kid programs and youth programming. 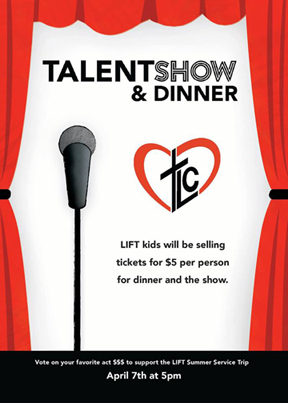 Wednesday, April 3, w/show rehearsal 6:30 p.m.
Wednesday, April 10, LIFT 6:30 – 8:30 p.m. 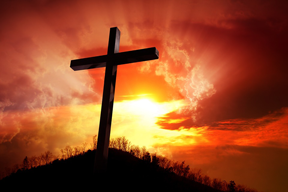 Confirmation class – Sunday, April 7, all grades 9:30 a.m.
Easter Breakfast will be served continuously from 7:15 to 11 a.m. on Easter Sunday, April 21. A sign up Sheet will be on the board by the office on April 1. Please consider signing up to bring something for the breakfast. A free will offering will help to offset costs of the Summer Service Trip. Menu: Hash Browns, Casserole, Jones Sausage, Fruit and yogurt parfaits, Sausage Gravy, Biscuits, Fruit, Assorted Baked Goods, Juice, Milk, Coffee And more that I haven’t thought of yet! Come join me for pizza at 6:30 and then we’ll head up for worship at 7 p.m. Please let me know if you are coming so I can order enough pizza. 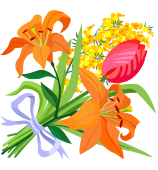 Download the form below to order flowers for the Easter Garden. Please return the form and $18 per plant to the church office no later than Sunday, April 7. Flowers may be picked up after the 10:45 a.m. service Easter morning. If they are not picked up by Tuesday, April 23, they will be delivered to shut-ins. Posted in Trinity Tidings, Uncategorized.